AURORA WATCH: High-latitude sky watchers should be alert for auroras on or about April 5th. That's when a solar wind stream is due to hit Earth's magnetic field. A similar encounter on March 27th produced Northern Lights over the United States as far south as Michigan and Oregon: gallery. 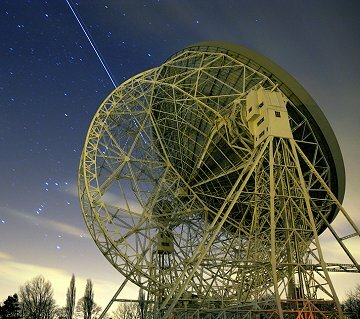 "The ISS was particularly striking as it flickered on and off as it flew 'through' the metal structure of the telescope. It reminded me of how the Pleiades, seen behind winter trees, have been likened to 'fireflies in a tangled braid.' We all agreed that it was certainly a memorable observation, so much so that as the spacecraft disappeared into the Earth's shadow we gave them a round of applause!" Another round of applause goes to European Space Agency engineers who built the remarkable Jules Verne. The robotic cargo carrier is able to maneuver around the ISS with pinpoint precision using its own onboard intelligence and optical sensors; human guidance is not required. Verne's historic first automated docking with the ISS takes place on April 3rd. 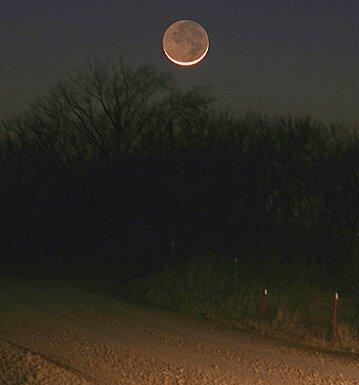 MOON WRECK: Last month, on March 8th, Doug Zubenel decided to photograph the slender crescent moon from a scenic spot in the country near his home in Kansas. He turned his car onto an unfamiliar dirt road and proceeded into the sunset. That's when it happened: "The brilliant setting sun did not allow me to see the cement railings on a bridge over a small creek until I was very close. The next thing I knew, I had totaled my car." Another crescent moon like this one is due on April 6th and 7th. It will materialize low in the west as the sun sets and the sky darkens to cobalt blue. "All we need is clear skies," says Zubenel. And, oh, can anybody spare a ride? On April 2, 2008 there were 948 potentially hazardous asteroids.